This design is a fresh new take on my Coriolis architecture, which first appeared in my book, New Pathways for Sock Knitters. The pattern offers a menu of choices for the leg: a diagonal ribbing can follow the Coriolis band from ankle to cuff, or the diagonal ribbing can begin later, a few inches before the top of the leg. For a Sweet Coriolis in its purest form, omit the rib altogether. I think the Sweet Tomato Heel offers the best of all foundations for the Coriolis design and am very pleased to offer this new variation. This is the ninth sock in my eBook, Cat’s Sweet Tomato Heel Socks. You may buy the whole eBook for $20 here (there will be 11 socks in total; each additional sock update makes your book longer until it is complete). The eBook can be put on any electronic device you have which will accept PDFs (computer, iPad, Nook, Kindle, iPhone, etc). You can also buy single sock patterns for $6 each. 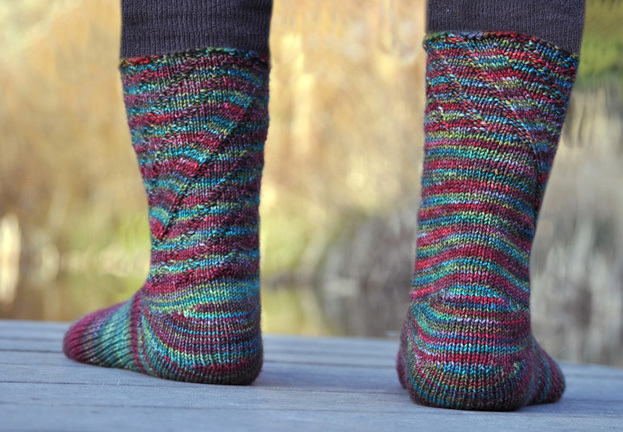 To buy the Sweet Coriolis Socks as a single pattern for $6, click here.